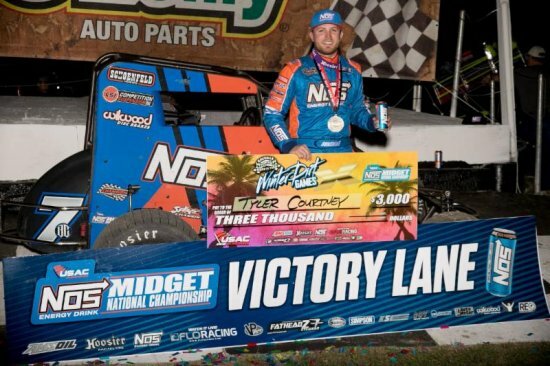 Ocala, Florida (February 8, 2019).........Tyler Courtney continued his winning ways in "Winter Dirt Games" at Bubba Raceway Park in Friday's USAC NOS Energy Drink Midget National Championship season opener. 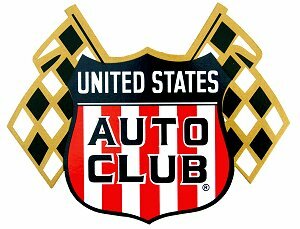 The Indianapolis, Indiana driver was victorious in the final two races of last year's USAC AMSOIL National Sprint Car portion of "Winter Dirt Games" en route to his first career USAC National driving title. Kicking off the year in grand fashion is the goal of anybody with championship ambitions, and Courtney believes this a solid first step in that direction on the midget side of things aboard his Clauson-Marshall Racing/NOS Energy Drink/Spike/Stanton SR-11x. "To win anytime is important," Courtney reiterated. "To get the ball rolling this early in the year, and obviously it's early, there's lots of stuff that could happen, but you've got to get yourself put in the right spot coming out of Florida. I think it shows on the sprint car side if you put yourself in the right position starting down here, it kind of makes things a little smoother throughout the year. I think KT and I are a testament that every point counts. You've got to be on top of your game every time you hit the racetrack. I think I only won one midget race last year, so to get one out of the way now, it gives me a better opportunity to win some more throughout the year." If there's anyone who knows that every point counts in a season-long run, even in the month of February, it's Courtney, who tied with Kevin Thomas, Jr. on the final tally for the USAC AMSOIL National Sprint Car championship a year ago. And it was those two once again who were tied at the hip, side-by-side in row three for the start of the 30-lapper on the 3/8-mile, D-shaped dirt track. "C.J. got a run on me, not necessarily the high side of three and four, but I knew I needed to get up there sooner or later," Courtney recalled. "I got back around C.J. in one and two and was able to take his lane away out of three and four and was able to drive right around Tucker. This place is all about getting track position early, especially with the midgets and how close we are." Courtney instantly stretched his lead as Leary got shuffled back to fourth, allowing Chad Boat to slide to third, then to second by Klaasmeyer on the seventh lap. As the frontrunners began to clamp down on the tail end of the field on lap 12, series Rookie of the Year contender and tenth-place-running Andrew Layser's night ended with a flat right rear tire in turn one. As Courtney would continuously showcase throughout the main event, every restart was on point, as he distanced himself from Boat time and time again, constructing a 1.5 second lead past the halfway mark. Courtney would continue to add to his lead incrementally until traffic was in near-sight, when Zane Hendricks' left rear tire went away, forcing him to a stop in turn one. It was Courtney's third consecutive win in his three most recent appearances at Bubba Raceway Park. It's a track that seems fitted not only to his liking, but also to the CMR crew, who certainly have proved they know how to prepare a car to run up front at this place with three of their four pilots finishing in the top-five Friday night, including Courtney at the top. "I think it kind of fits my style," Courtney said. "Tim (Clauson) on the midget side has them going really good down here, and Rizzy (Tyler Ransbottom) on our sprint car stuff, they obviously work with each other, so we've got a really good feel for this place. I'm just fortunate to be driving them. It's a really good start to the year with our new NOS Energy Drink partnership. This is a fun racetrack and I've taken a liking to it. I won't complain about that." 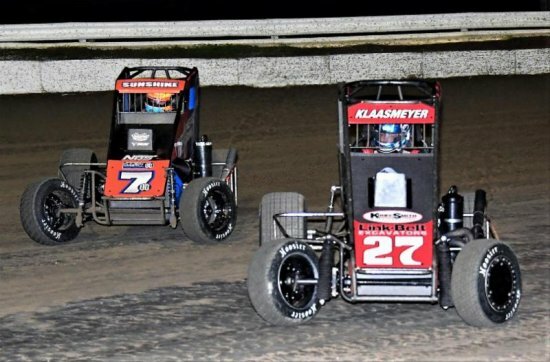 USAC NOS ENERGY DRINK MIDGET NATIONAL CHAMPIONSHIP RACE RESULTS: February 8, 2019 - Bubba Raceway Park - Ocala, Florida - "Winter Dirt Games X"
NEXT USAC NOS ENERGY DRINK MIDGET NATIONAL CHAMPIONSHIP RACE: February 9, 2019 - Bubba Raceway Park - Ocala, Florida - "Winter Dirt Games X"